French Front National leader Marine Le Pen is in New York on an unannounced visit as France’s presidential election approaches. After speculation over the nature of France Front National leader Marine Le Pen’s visit to New York, she has been spotted today in an apparent meeting over Coffee at the Trump Tower Ice Cream Parlour. The pictures show the French Presidential hopeful sitting with a group including her long-term partner Louis Aliot. Following the emergence of the pictures, a senior Trump aide confirmed to Breitbart News she is not meeting with the president-elect or the transition team. Ms Le Pen, who is currently leading in the polls, is visiting the city in a private capacity, according to her campaign chief David Rachline. Bloomberg quotes an unnamed aide to Donald Trump as saying the President-Elect has no plans to meet with Ms Le Pen. 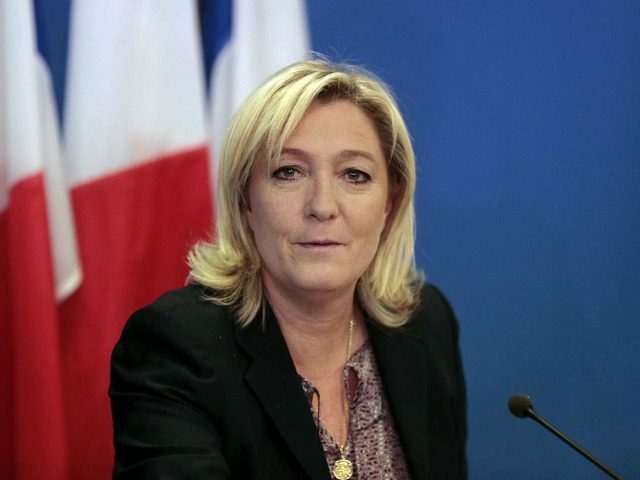 Marine Le Pen has been an outspoken supporter of President-elect Trump over the course of the United States Presidential election cycle. The visit comes after a number of meetings between the President-elect and Britain’s Nigel Farage, and has launched a raft of speculation on Twitter over the nature of the visit. One poll earlier this week put the Front National leader ahead of centre-right candidate François Fillon in the race to be France’s next president. The poll by Ifop-Fiducial put Ms Le Pen on 26 to 26.5 per cent support, while Mr Fillon was on 24 to 25 per cent. However, she may still face defeat thanks the France’s two-round electoral system, with 64 per cent of voters saying they would vote for Mr Fillon in a runoff between the two candidates. Ms Len Pen is gaining support with her populist, Eurosceptic policies. She has already pledged to renegotiate France’s membership of the European Union and put the result to a referendum. She has also signalled her opposition to France’s membership of the euro currency, which many French people blame for holding back the economy and impoverishing them. However, she has also gained large support for her strong-borders views and her opposition to Islamisation. Her popularity rose in particular after last July’s terror attack in Nice, when she called on then interior minister Bernard Cazeneuve to resign after a spate of Islamist attacks. “In any other country in the world, a minister with a death toll as horrendous as Bernard Cazeneuve – 250 dead in 18 months – would have resigned a long time ago,” she said. She added that the main cause of the wave of Islamist attacks in France is Islamic State and their “murderous ideology that we let develop in our country”.